After living on the streets, Sparrow eventually found her way into an apartment complex and decided to hang out there for a while. 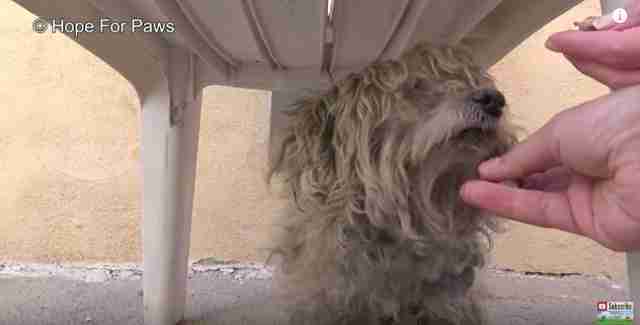 The dirty, incredibly matted dog was limping and clearly injured, and after noticing her a few times, residents decided to call for help. … but as soon as they spotted her, they quickly realized that wasn’t going to be a problem. Despite all the pain she was in, Sparrow was SO excited to see her rescuers, mainly because of the food they were holding. 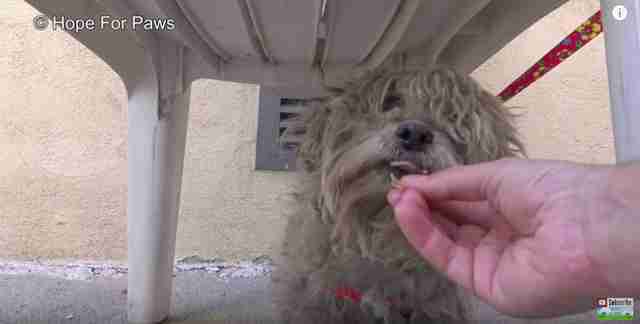 The poor dog was absolutely starving, and eagerly took everything her rescuers offered to her. … they were finally able to slip a leash around her, ensuring that she was safe. 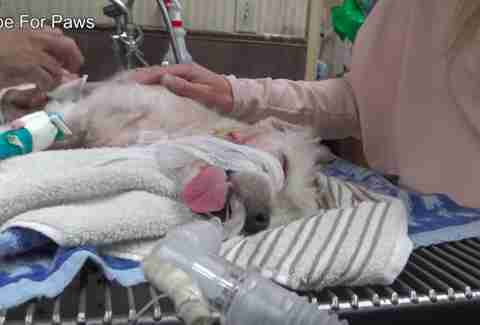 As soon as Sparrow was secured, rescuers gently picked her up and rushed her to the vet. Sparrow went with them calmly, and seemed to realize that she was finally going to get the help she so desperately needed. … and found that not only did she have a very badly broken leg, she also had a huge tumor on her ear, as well as a few other small tumors. Luckily the tumor was benign, but carrying such a large tumor around on top of having a broken leg was likely causing poor Sparrow a lot of pain, and her rescuers were shocked that she was able to survive on the streets in her condition. Despite all the pain she was in, though, Sparrow calmly allowed the vets to examine her, and was probably hoping that they would be the ones to finally make all the pain go away. … and within a few days, Sparrow was already a completely different dog. 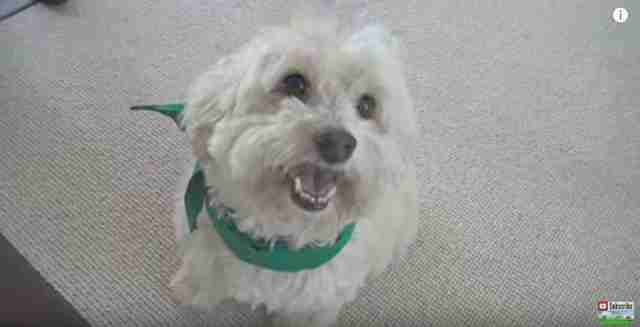 Her pain was gone, and she could finally live her life like a typical, happy dog. A few weeks later, Sparrow found her forever family and is now living out her happily ever after. 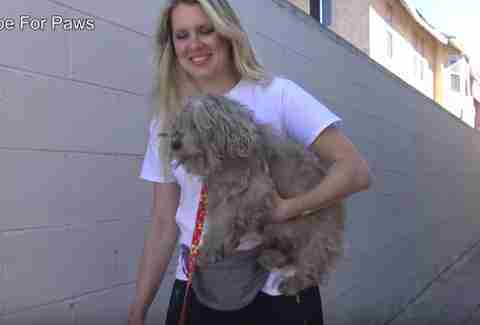 She’s white, fluffy and healthy now, and looks so different from the dirty, matted dog she was when rescuers first found her. 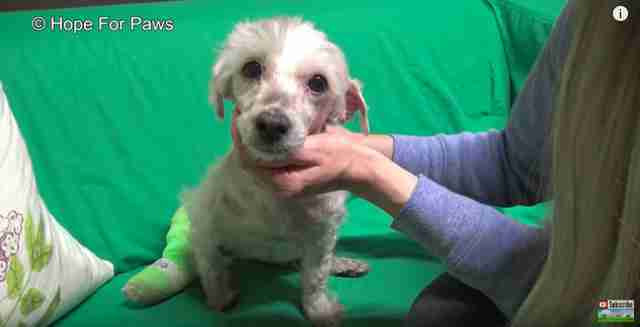 She no longer has a limp and can run as fast and as far as she wants, all thanks to the rescuers who took the time to save her life.